Today is 五月 初三. It's Baby G's lunar birthday. Actually I forgotten all about it til Daddy reminded me in the morning. We went into his room to sing him a birthday song. He listened til we finished & promptly went back to sleep again. In the evening, Ah Ma came over to celebrate his birthday for him. As always, she would prepare mee-sua & red eggs for the birthday boy. ==> Baby G enjoying his mee-sua dinner. After his bath, I let him wear his new 'Thomas the Train' PJs. He was so happy that he let me take a photo of him; he even gamely posed for me. But... the best part of the entire day was his brand new bicycle from YeePo. He was so excited when he saw his gift. He just couldn't wait to start riding it, kept disturbing Shu Shu who was helping to adjust the bike to his height. Initially, he wasn't too sure how the pedal worked and had to use a lot of effort to start the bike moving, but after a while, he got the hang of it. We shifted the furniture a little to provide some space for him to ride the bike. 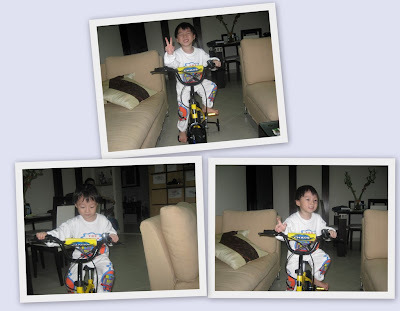 He started slowly & cautiously but after a while, he threw caution to the wind and started to cycle faster & faster. I was the makeshift traffic light so that he would have stop & start again. At least, it slowed him down a little. Happy Lunar Birthday, my son! cool bike! maybe can get bb G & ezra to ride together some day. Definitely! Need to get him the helmet so that he can look as professional as Ezra. haha.